I am breaking myself in gently today, suffering as I am from the twin apres-holiday maladies of jet lag and SWS (sun withdrawal syndrome). If you read my last post you will know that Mr A, Miss R and I were visiting my family in the sunshine state of Florida for a couple of weeks. Our visits are always maximum relaxation and minimum stress (although being within 20 feet of a 12 foot alligator was a bit stressful). But unusually on this occasion, minimum cooking too. On most visits home I manage to wrangle my way into my Dad’s or sister’s kitchen, laying waste to every pan and utensil in my path. I did whip up some cornbread, as well as some lemony courgette & fine bean tagliatelle (with added Italian sausage in concession to my meat-loving nephew – delish). And Mr A showed my Dad how to make beetroot zinger using Dad’s snazzy new 1.1 hp juicer – our early Christmas present to him. But as my strained zip will attest, there was an awful lot of extra-kitchen eating. In all honesty it was mainly healthy, but definitely a bit too much. To whit, the massive burrito from ethically-minded chain, Chipotle Mexican Grill. This whopper was stuffed to bursting – literally. The chap had to start again after a spectacularly messy tortilla ‘malfunction’, a la Janet Jackson/Judy Finnegan. And it was about the weight of a newborn baby. Although the burrito sufficed for linner – our American-use-only portmanteau for lunch and dinner, and had impeccable provenance, the green rice, barbacoa and black bean-filled serape of deliciousness was OTT for us. For anyone. Sure it was great-tasting, but it is indeed thought-provoking/disgust-making/irresponsible/all of the above that even healthy restaurants and eateries serve food more suitable to ditch diggers and Olympian rowers than keyboard clickers and checkout workers. In my opinion, healthy eating is all well and good – a necessity even – but over-indulging on a day to day basis, even on organic and vegetarian foods, isn’t good. Sure, the micro-nutrients from whole grains, nuts, fruit, beans, low-fat dairy and meat contribute to optimal health, but the excess calories from eating more than our bodies need to maintain a healthy weight isn’t so clever. However when it is made for you (yippee – no dirty dishes! ), at a great price, has healthy ingredients, and plays the xylophone on your taste buds, well, that’s pretty tough to resist. Super-human willpower is often called for on our Stateside visits. What do you think? How do you resist the siren’s call of the all-you-can-eat mentality? So, heavy of heart (and scale) it is back to ‘auld claes and cauld porritch’ for us. Well, not quite: this morning I had some non-fat plain yogurt with a chopped fresh fig, some raspberries & a handful of blueberries. Lovely it was. 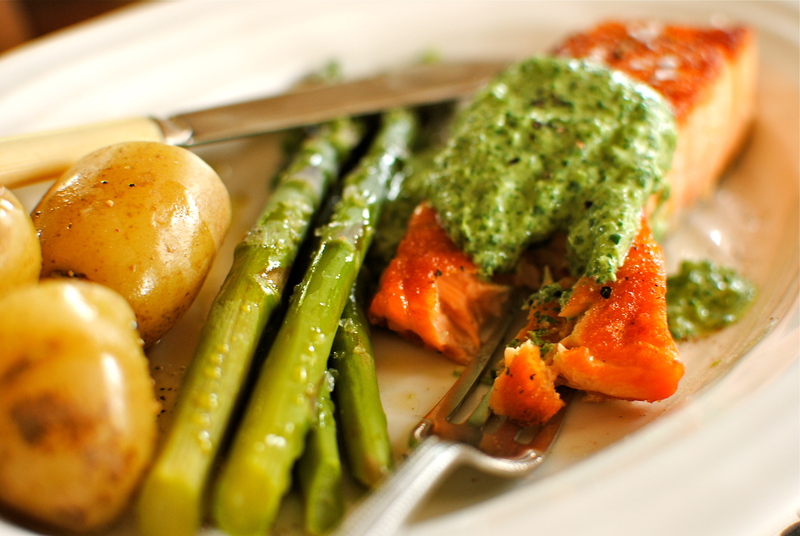 And tonight is roasted salmon fillets with the world’s simplest watercress sauce (more of that later). Come the weekend, when the temperature is predicted to take a dive, out will come the actual ‘porritch’. But before I go all food temperance on you, I want to share the lovely recipes that some of you kindly sent in. The portion control is up to you! I recently called out for your favourite healthy autumn comfort foods, and you didn’t disappoint. All the recipes look so fantastic and I hope you think so too. Some of you non- food bloggers also had some firm ideas about what’s good to eat right now, so I’ve tried my best to play matchmaker with your ideas and purloined recipes from chefs of note and repute. 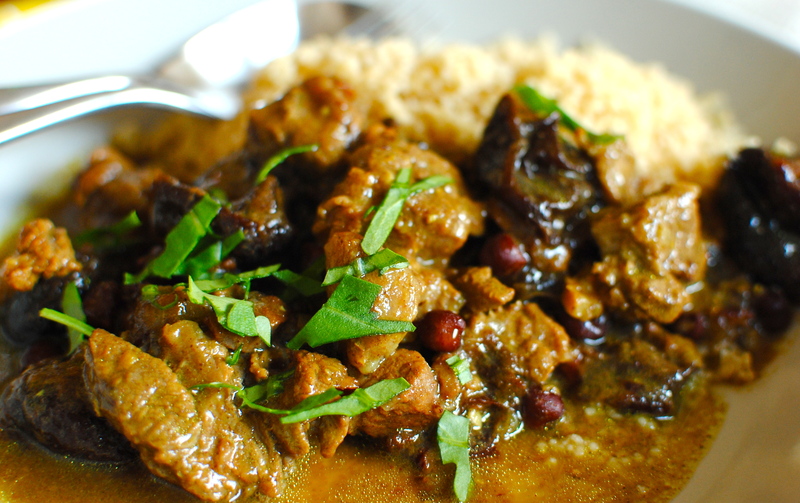 To start things off I have included a meaty family favourite of ours (sorry vegetarians and vegans!). After the past two weeks’ indulgences and relative sloth I am likely, however, to attempt to find comfort (in waistband as well as soul) in raw salads and lots of water. 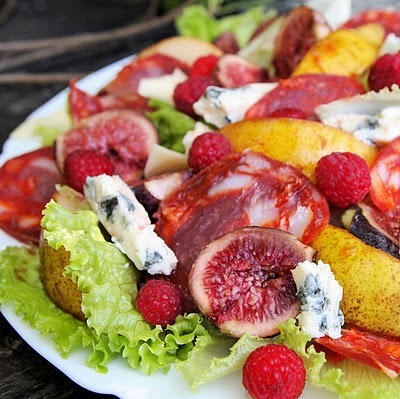 Karen Burns Booth’s Fig, Raspberry and Pear Salad – minus the lovely looking cheese – looks the business to get me started. Wish me luck! And please click on the links to the recipes – they all look wonderful. 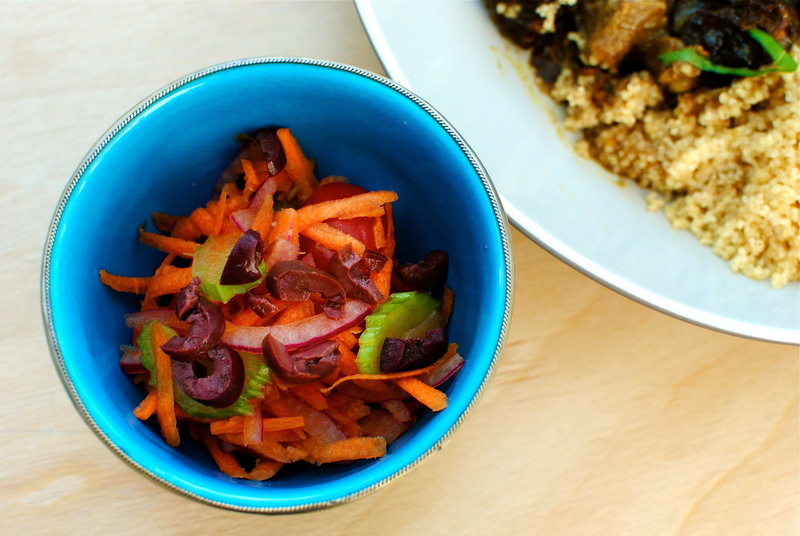 Oh, the image from Karen’s pretty salad is sadly only a thumbnail, but please go and have a look at her website for the full size image and the easy-peasy recipe. Sorry Karen! Incidentally, if you are in the Tampa Bay area, check out the comfort foods at Mama’s Kitchen (Mr A loved the liver and onions, which I will NEVER make), Chattaway in St Petersburg, Jason’s Deli (we brought the takeaway menu home to drool over, and it’s just been named best restaurant by Parent magazine) and Cappy’s Pizzeria (the marinara sauce on their veggie pizza was the best I’ve ever tasted). If your tastes are more high falutin’ (in which case, you wouldn’t use that phrase, would you? ), try Seasons 52 for their under-500 calorie gourmet yummies. And for the best deviled crab in the most unlikely looking place, swashbuckle into Gaspar’s Grotto in Tampa’s Latin quarter, Ybor City. Rosie goes for traditional British Comfort Food (I thought it deserved caps) in a big way, choosing scotch broth, shepherd’s pie and a fruity sponge pudding. 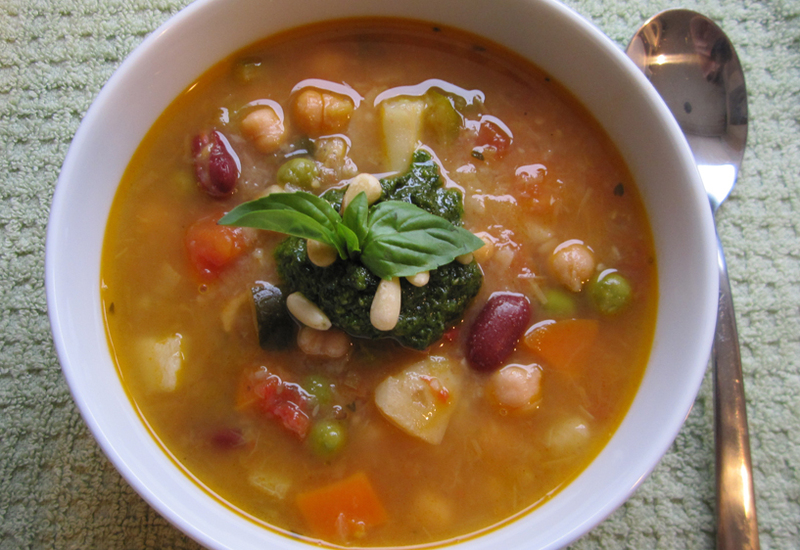 I use a traditional scotch broth recipe based on one from Simon Hopkinson so I’ve linked you to it, but the others I have not tried – but they look fab and are from reliable food writers Nigel Slater and Angela Nilsen, respectively. I will post a vegan shepherdess pie in the near future, but I hope you like my links, Rosie! Rachel loves fish pie, so here’s a link to a good-looking, vegged-up one from Jamie Oliver, as well as my own one. Beef stew is the choice for Morven, and here is one I rely on from americanfoodabout.com that’s similar to one my Mom used to make – although I wish my Dad would write down his version for me. And many folks’ comfort food of choice is the same as Anne’s: macaroni cheese. 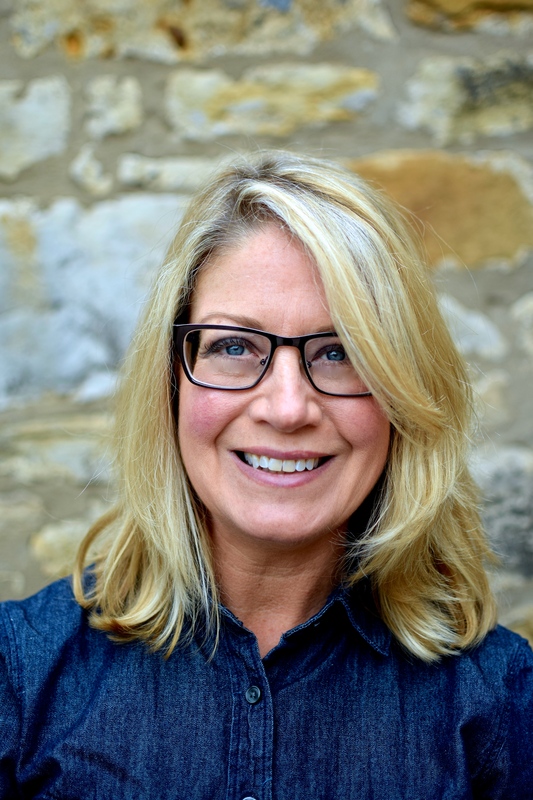 Angela Nilsen, writing for BBC Good Food magazine, has a great lower-fat version for anyone wanting to indulge without the bulge. I do a lower-fat, non-bechamel one that may get a photo session soon. Like Angela, I always include tomatoes as they add nutrients, but mainly because they keep this homey dish from being ‘samey’. Do you have a trick with your mac ‘n’ cheese? 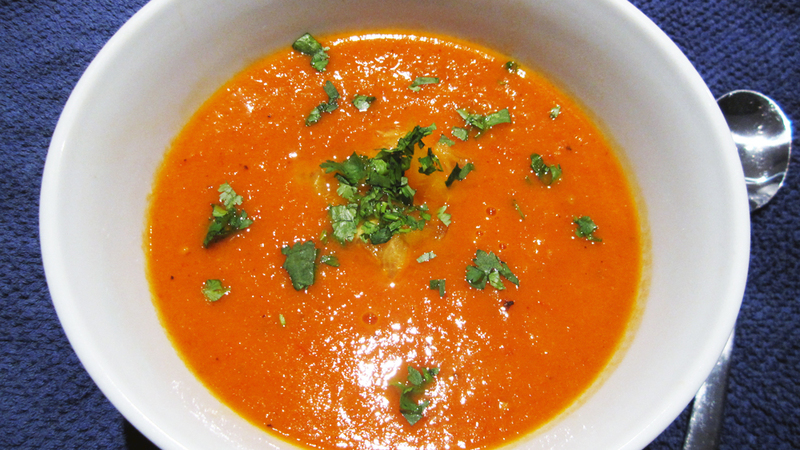 Put the oil and meat in a large casserole or saucepan with the ginger, saffron, 1 tsp cinnamon, s, p, onion and garlic. 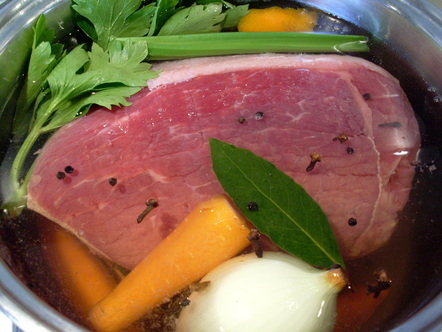 Cover with water and simmer gently, covered for 1 and a half – 2 hours, until the meat is very tender, adding just enough water to keep it covered. You could do this in a slow cooker too. Place couscous in a large, shallow bowl with the salt, if using. Pour over the hot water, stir quickly and immediately cover with clingfilm. Let this sit for eight minutes before removing the film and rubbing in the butter and oil, separating the grains as you go. This is a very tactile way of cooking that is great for avoiding claggy lumps. Quick Little Side Salad/Salsa: grate some sweet carrots, chop some tomatoes, celery and parsley, slice a red onion and stir this together with a little lemon juice and some sliced black olives. Add in as much harissa paste as you dare! A great foil for the sweet and tender meat. 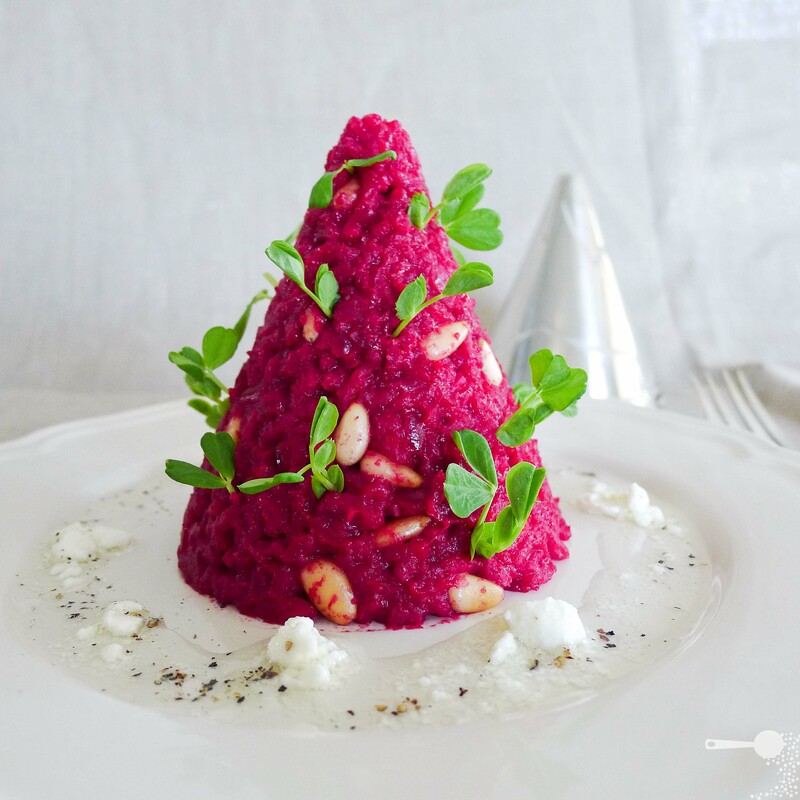 Beetroot and pine nut risotto with Chevre dressing from Martyna. Stunning photo! Yikes, I’ve just read your delicious post on an empty stomach and I am now so hungry I will have to stagger to the kitchen to fix our meal. 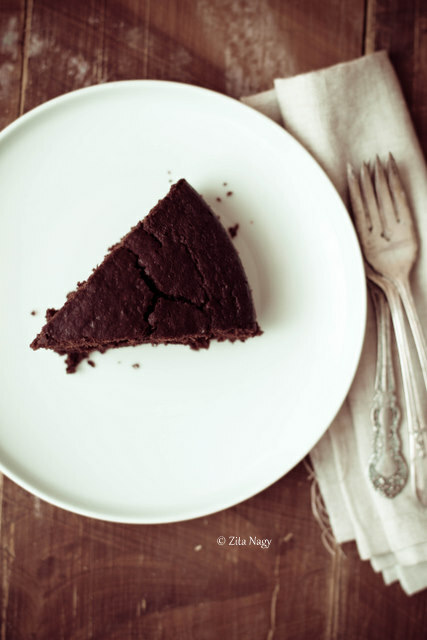 Lots of great ideas here (love all the pics especially Zita’s choc cake), brilliant post. Welcome back! 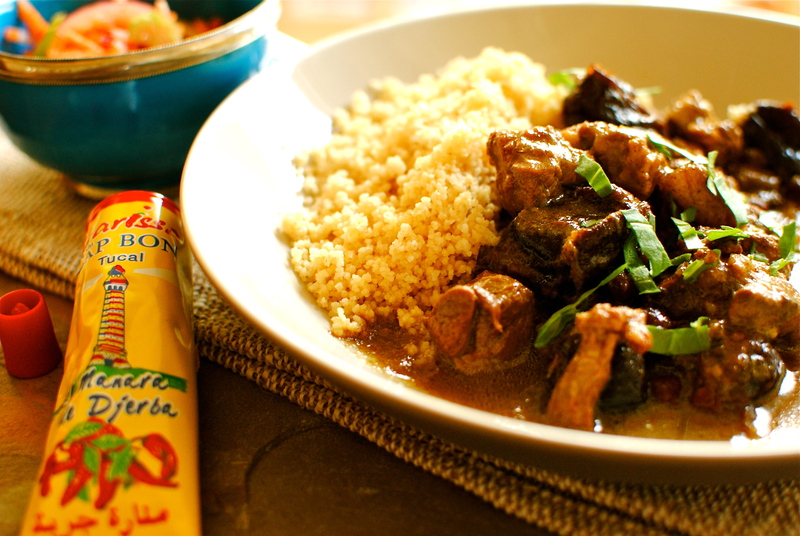 Love the tagine with prunes, yummy! I have a large packet of locally produced prunes on my counter. Now I know how best to use them. Thank you also for the link and shout out! Thanks Lizzy 😀 You are welcome for the link, but a big thanks for the recipe. Reminds me of my childhood. I hope I can get a similar brisket here so I can make it. Bet you are warming up nicely so won’t be needing too many comfort foods. Jealous? Moi? Hope you like the links I chose for you. WELCOME back Kelly! 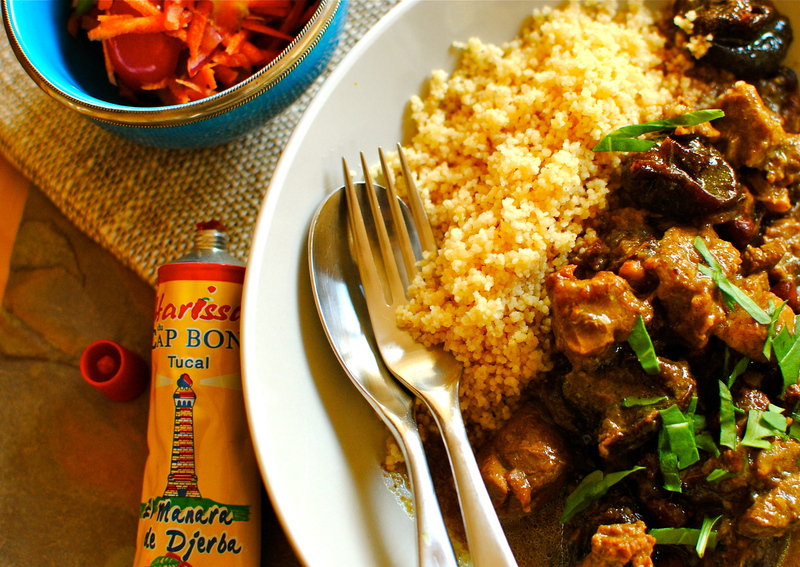 And with such a GREAT looking meal too ~ I spy Harissa Paste, I can INHALE that stuff, I totally love it! Many thanks for showing my salad too…..it is one of my favourite combinations! Hi Kellie, love the sound of your tagine – prunes are so lovely in many ways 😉 thank you for including my beet risotto in your round up too!